The third annual summit will take place in New York City and will be livestreamed globally on June 21st, 2019. 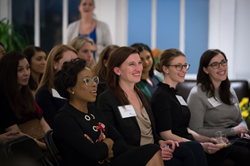 The 2019 Mobilize Women Summit has been made possible by generous support from The Prudential Insurance Company of America, RBC Wealth Management – U.S., Mastercard, The Guardian Life Insurance Company of America, Gartner, NFP, and Paul Hastings. If you’re interested in supporting this year’s summit, there is still time – click here to learn more.